Welcome to Nick Gudge's website! David Gaffney & Davidine Sim have a new book out - Masters & Methods. Go and buy and this book! It is excellent. I have read it four times and hope to have a review out shortly. on Wednesday 21st February at 8.05pm. Please note that Grandmaster Wang Hai Jun's Next Seminars in Limerick that were to held on Sat 19th & Sun 20th January have been postponed as Grandmaster Wang has had to return to China urgently. I hope to reoganise at a later date. This website is mostly a repository of some of my writings. I write primarily to try and clarify my thinking and refine my understanding. Most of the articles to be found here were not aimed at improving other’s understanding but at improving my own. They were derived from experience primarily. It is as a consequence of others asking to read them that I have rewritten and put them into the public domain. Initially I have put up the pieces I think most helpful to see how it goes. Any comments suggestions or criticisms are welcome. Please feel free to copy them but please acknowledge where they came from. I was born in 1962, come from a very large family and have travelled widely. I have lived in County Clare since 1994. I live with my partner Kim & our three children. We live in a house we designed and built with a garden and orchard we designed and planted. I value honesty and integrity: I respect these and perseverance greatly. I am a fairly private person. I have had many people try to teach me and many more inspire me. Only a few of these have been my teachers although many have inspired me. Highest of these are my partner Kim and my children Rowan, Amber and Cormac. They continue to suffer my foibles without too much complaint for which I am very grateful. 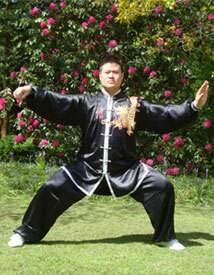 In Taijiquan my greatest teacher is Wang Hai Jun to whom I own almost all my understanding. In Woodwork my greatest teacher was Derek Glew. In Building I am particularly indebted to Ewen McEwan: I wish him well on his journey. In Gardening I thank the garden itself which has guided us to something inspirational and beautiful. My thanks to all those who have helped me on my way and borne the brunt of my enquiries and investigations and willingly ‘suffered’ in conversation and discussion with me. I remain dedicated to life long learning.